If you have amounts of more than €3000 to exchange and transfer to an overseas bank – you will usually get better rates from using specialised currency brokers instead of your own bank. 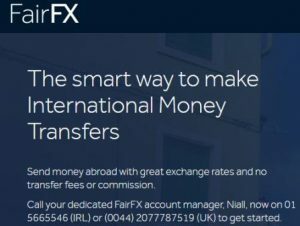 If you are planning on making a large transfer of currency – this is probably one of the cheapest way of converting your Euros to Pounds or US Dollars or other currencies. Currency Solutions are specialised currency brokers who are registered with the UK Revenue and Customs as an authorised Money Service Business. They will carry out transfers to Sterling , UD Dollars, Australian Dollars, Thai Baht – as well as most major currencies. You can make a no obligation enquiry about your currency requirement. All you need is a bank account to transfer the money from and another one to pay it into. You can call Currency Solutions on their Irish number which is 01 431 1344 or on their UK number 0044 207 740 0000 . Ask ask for the Money Guide Ireland contact – Ernie Enver. He should be able to give you a quick response to any queries. For smaller transfers you could try CurrencyFair . They operate “peer to peer” currency exchange – cutting out the banks and for a small fee allow you to get exchange rates that are pretty close to the interbank rates. These are good for sending smaller payments to family abroad or for purchases in foreign currencies . « Unlimited Electricity – Is it Too Good to be True ?